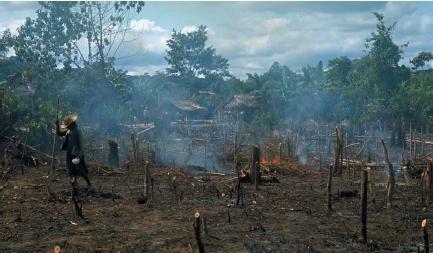 Usually, some type of slash-and-burn system is used when vast areas of tropical rain forest are converted into large-scale, industrial farms. However, slash-and-burn is more often used by individual, poor farmers who migrate to the forest frontier in search of land on which to grow food. Poor farmers operate on a smaller scale, but since there are many such people, huge areas are ultimately affected. Slash-and-burn is an often permanent conversion of the tropical rain forest into farmland, leading to severe environmental problems. Although many species of trees and other plants grow in mature tropical rain forests, the soil of many forested sites is actually quite infertile. This poor fertility is a direct result of the climate in which tropical rain forests exist. The warm, wet tropical climate is a perfect breeding ground for bacteria and other microorganisms, which decompose or break down much of the organic matter in tropical soils. Heavy tropical rains leach (dissolve) much of the remaining organic matter or soil nutrients. The plant species that are native to the tropical-forest ecosystem are well adapted to this soil infertility. (An ecosystem is an ecological community, including the plants, animals, and microorganisms, considered together with their environment.) They are able to absorb and conserve the small concentrations of nutrients in the soil. As a result, most of the organic nutrients in tropical rain forests are contained in the living vegetation, particularly in trees. After these trees are felled and burned, the nutrients are found in the remaining ash. However, this is a short-term phenomenon as the nutrients are quickly leached or washed away. The overall effect of slash-and-burn agriculture is a rapid decline in the fertility of the land. Trees in tropical rain forests store huge quantities of carbon in their tissues, helping reduce the amount present in the atmosphere. The loss of tropical rain forests and the increased use of fossil fuels (such as oil and gas) have led to increased concentrations of carbon dioxide in the atmosphere—what scientists call the greenhouse effect. Old-growth tropical rain forests are the most highly developed and diverse ecosystems on Earth. Tropical deforestation, mostly caused by slash-and-burn agriculture, is the major cause of the great wave of plant and animal extinctions that is presently plaguing Earth.